The ancient Egyptians believed that we die twice — once when our soul leaves our body, and again after the death of the last person to speak our name. They believed that to speak the name of the dead was to make them live again. I’ve received many kind notes and comments this past week about my Remembrance Day post and I wanted to share a bit more of what I’ve uncovered about Lewis Lowe and his lineage. Speaking his name won’t bring Lewis back, but it can ensure he gets the recognition and respect he deserves for the sacrifices he made. 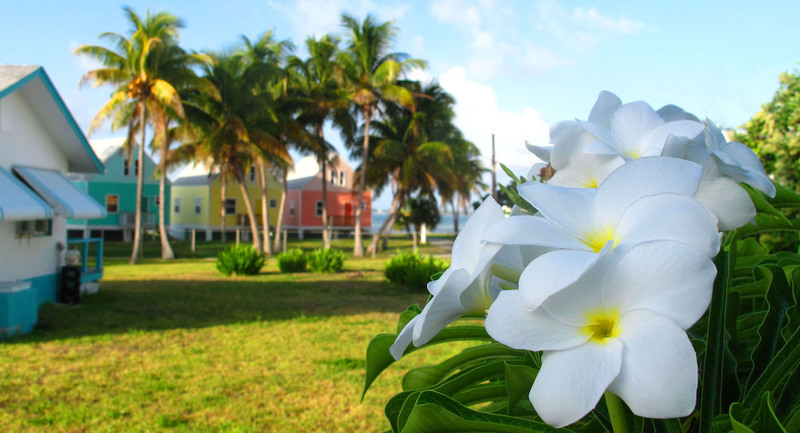 Lewis Pearson Lowe was born in New Plymouth, Green Turtle Cay on August 28, 1888. Though the birthdate is off by two days, and the child’s mother is listed as Sarah “Sweeting,” I’m confident that the document above is the record of Lewis’ birth. 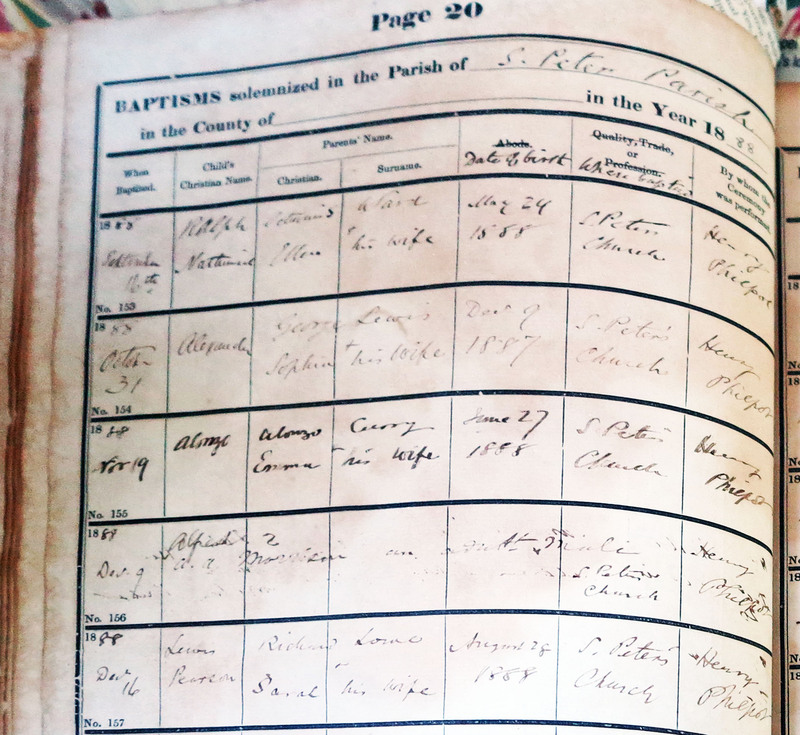 Whereas the birth date of Richard and Sarah Lowe’s son is recorded as 26 August 1888, records from Lewis’ baptism in December 1888 (see below) and his 1915 enlistment in the military independently confirm that his birth date was, in fact, August 28. 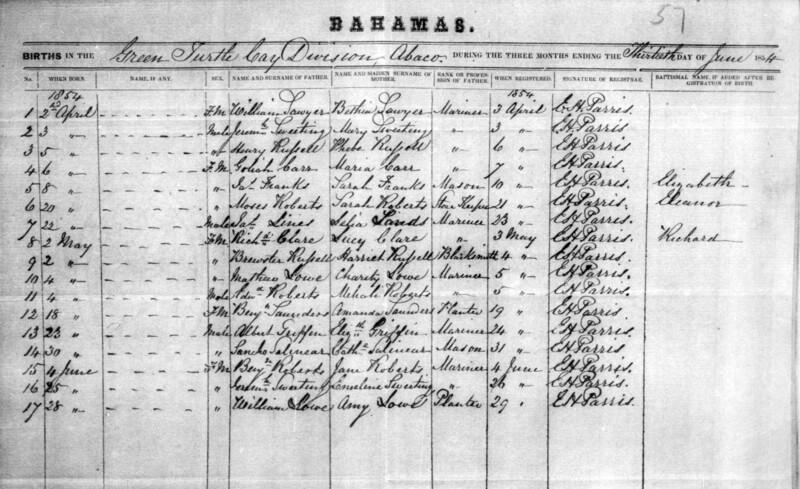 The bottom record of this document shows the 16 December 1888 baptism of Lewis Pearson Lowe at St. Peter’s on Green Turtle Cay. His date of birth is shown as 28 August 1888. 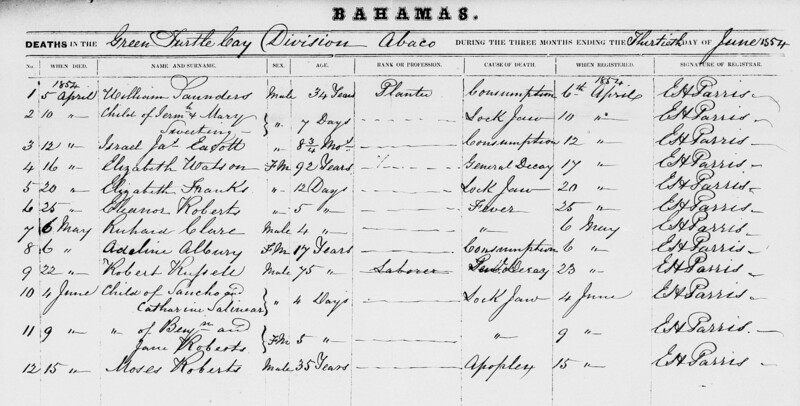 Lewis’ mother, Sarah Sterling was born 26 February 1867 and, as mentioned in my Remembrance Day post, died 25 October 1892 on Green Turtle Cay after the protracted delivery of twins. We know that Sarah Starling’s parents were Timothy Mark Starling, who I believe was born around 1820, and Sarah Gates Roberts Starling, born about 1829. Unfortunately, this marriage would prove neither long nor happy. Less than a year later, Sarah Roberts gave birth to a little girl, Eleanor. Sadly, at only five days old, baby Eleanor would die of a fever. And just two months later, her father Moses would succumb to apoplexy — which we know today as a stroke. It appears that Sarah Ann Lucinda Starling was Lewis’ mother. 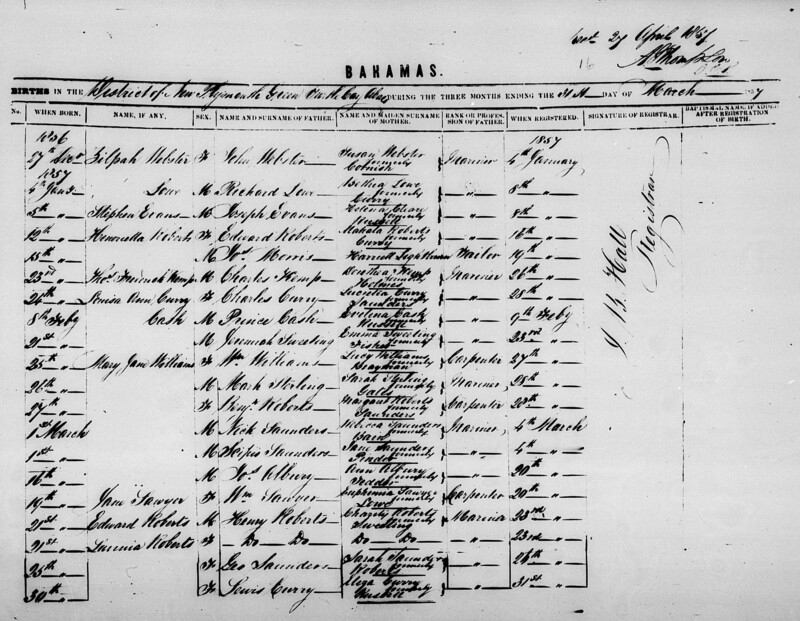 Per the death records below, I believe Mark Starling died in Nassau on 12 October 1874, two years after the birth of his last child, Elizabeth. An interesting side note about Mark Starling. According to the Bahamas DNA Project, he does not share ancestry with 80 other Starlings and similar surnames who have been tested. He does appear to be related to individuals with the surnames Middleton and Gordon, and it’s believed they all share a direct paternal line ancestor who lived in Scotland. My search into Lewis’ paternal lineage has not (yet) been as fruitful. We know from E.H. McKinney’s original letter to the editor in 1917 that Lewis’ father died in 1900. and the will of Reverend Charles John Thomson – who carried Lewis to England – confirms that the child’s father was named Richard Lowe. According to the above record, Richard Lowe was 47 when he died in 1900. Depending on whether he’d already had his birthday that year, he would have been born either in 1852 or 1853. 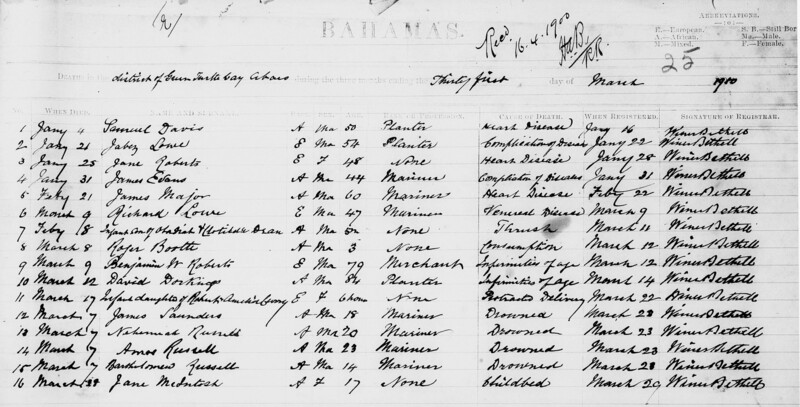 Strangely, the Bahamas civil records don’t show any record of a Richard Lowe (or any unidentified Lowe male) born in Green Turtle Cay or other parts of Abaco between 1852-1853.
he was born somewhere other than the Bahamas. Does anyone have a Richard Lowe (b. 1852/3, d. 1900) among the branches of their family tree? And does anyone know who the ancestors of Timothy Mark Starling (1820-1874) and Sarah Gates (1829-1919) are? 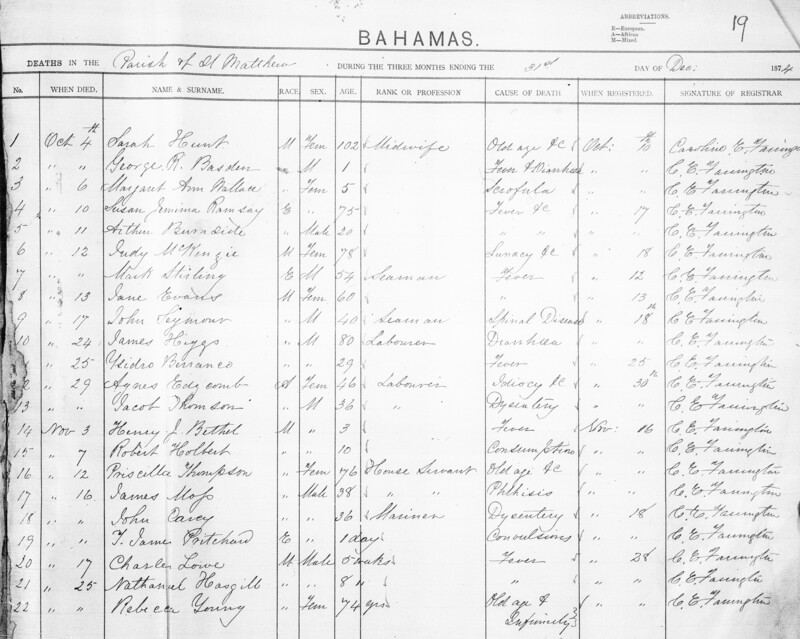 It would be great to be able to identify familial connections between these folks and present-day Bahamians. I continue gathering information — and even a few World War 1 artifacts — with the aim of putting together an exhibit about Corporal Lewis Pearson Lowe at Green Turtle Cay’s Albert Lowe Museum. In this way, we can help to bring and keep his name and story alive for future generations.